Tuesday was June 21, the Fête de la musique, a summer solstice street festival that’s a big deal in Paris and some other francophone countries. I have had a good time at the festival since I first stumbled on it in 2011, including barhopping with Jared W, Geoff and Hugues in 2013 and doing it on my own in 2014, with the most amazing time being last year (2015) when I enjoyed it with Sawyer and Seth. This year I was on my own again. Instead of focusing on the Marais, as in prior years, I decided to stroll over to the 10ème arrondissement, around the Canal Saint-Martin, to see what the festival was like over there. La Baraque A is a mild-mannered coffee shop the rest of the year, but it hosts an electronic dance party for the Fête. The music was just starting up when I arrived so I had a beer on the terrace of a café, then strolled further on. When I looped back later it had become quite a scene: La Baraque A Dance Party in Full Swing. There were similar crowds outside restaurants and bars all around the quarter, in each case racially mixed, often multi-age, but with a consistently lefty/hip/hippie vibe. I didn’t notice much of a Muslim presence, and I suspect that this is the Achilles heel in the “melting pot” character of the neighborhood. I found the 10ème quite sympa, and I would consider staying there another year. But after a couple of hours on my own I headed home and got a good night’s sleep instead of partying until dawn. When I got to Paris this year I noticed a new restaurant on rue des Petits Carreaux, Caminito, an Argentine bistro. I passed it by initially since South American cuisine is largely red meat, which I try to avoid. But on Wednesday I noticed that the plat du jour was fish so I had lunch there, which I quite enjoyed. That afternoon I headed out to find a park to do some reading in. I first went to a completely new area, Parc Sainte-Périne in the 16ème, but it just seemed like an enormous playground. Great for bourgeois kids but not inviting to an adult reader. Disappointed in my exploration I hopped the tram over to tried-and-true Parc Montsouris in the 14ème. I had brought an umbrella just in case and found that I needed it at times even though there were also welcome intervals of sunshine. This year’s summer started out looking a lot like its spring! The temperature had gotten up to 80 on Wednesday and on Thursday it was actually hot for the first time this year — high 80’s! Instead of sunbathing my thoughts turned to air-conditioning, so I decided to check some museums off my list. I had expected to visit the Musée d’Orsay a few weeks earlier with Sherard, but the Great Flood of 2016 put paid to that idea. Consequently, I headed over to see the Doanier Rousseau exhibition, and revisit the permanent collection. 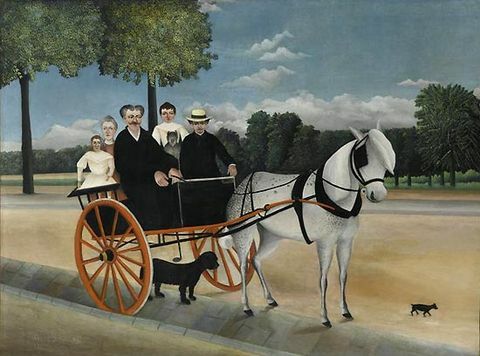 The title refers to the fact that Henri Rousseau started painting as a weekend hobby while working as a customs agent. I was mostly familiar with a few of his weird jungle scenes, and an iconic image of a family in a carriage. I hadn’t realized, however, that he was self-taught, and was (initially at least) more of a folk painter than a professional artist. His portraits have that weird quality of looking straight out at you that you see in the works of American folk artists. He did have a good eye for color and could put paint on the canvas, but those skills alone wouldn’t have gotten him anywhere. What made his reputation was the weird and wonderful imagination that populated his jungle pictures. He never left Paris but had a rich vision of a fecund and brutal imaginary world. I was also reminded of the fact that real people can be at least as fabulous as those depicted in the artworks. The Orsay admission also includes the Orangerie museum in the Tuileries, so I walked over there and revisited Monet’s two immersive waterlily rooms, as well as the impressive impressionist and post-impressionist collection on the lower level. On Friday I decided to check out the new shows at the edgy contemporary art museum, Palais de Tokyo, which I have sometimes loved and sometimes loathed. Although I liked several of the shows I saw there in mid-May the current crop left me stone cold, except for a few individual pieces and a wonderful sonic work by Ayoung Kim called “In This Vessel We Shall be Kept”. The concept of the work is crazy but remarkable: We are asked to take refuge in an ark against another great flood, but the ark in question is the Palais Garnier! There are some graphics explaining this conceit and giving the text of an immersive choral performance, which is the heart of the work. These texts are from various sources, including the Epic of Gilgamesh, the Bible and the Koran, which all exhort a chosen few to build an ark to survive a flood. You experience the choral work in a comfortable seat in a dark room, surrounded by eight speakers. I posted a clip to give you a taste, but you need to hear it for yourself! As in prior years, I stumbled on some Fashion Week models at Palais de Tokyo; cute and emaciated as always, but this year with strikingly kookie hairdos. Since it’s right there and free (except for the temporary shows) I also stopped in to the Musée d’Art Moderne de la Ville de Paris. I ended up paying for two of the shows, which were both pretty good: Paula Modersohn-Becker and Albert Marquet. Modersohn-Becker’s early portraits had a naive aspect reminiscent of Henri Rousseau, but her skills advanced rapidly, until her untimely death. Photos aren’t permitted in the shows, but I noticed this grisly little picture in the permanent collection, which is quite good even though overshadowed by the Pompidou.